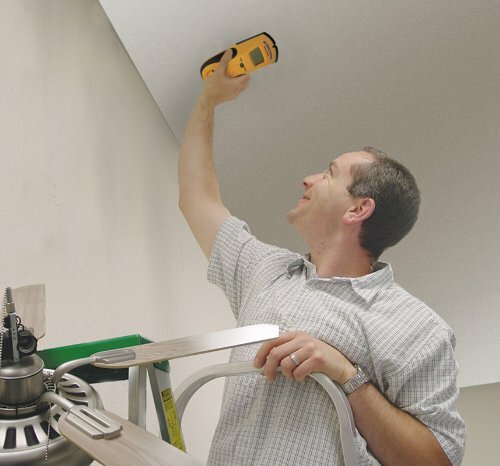 Whether you’re looking to mount your TV on a wall or hang a picture, you’ll need stud finders to get the job done professionally. 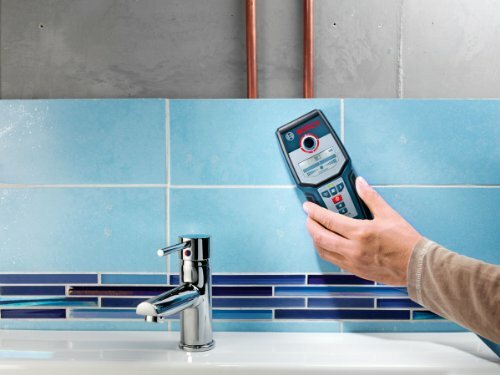 So, what should a good stud finder be (or not be)? 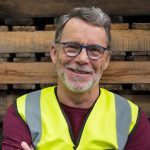 With so many brand options available on the market, the journey of picking the perfect one has become even more difficult. But it doesn’t have to be like that forever. We review some of the best stud finders on the market and examine the value they offer. 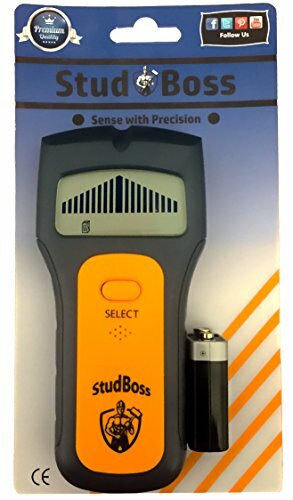 Inexpensive, simple and reliable; this is one of the best stud finders around for people who want to save time and some money too. 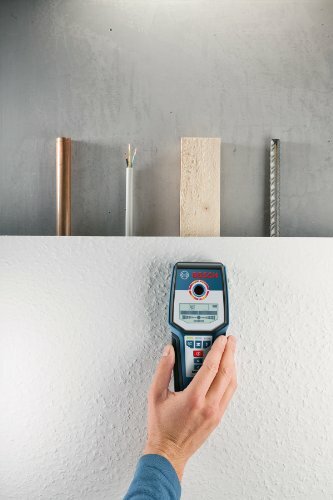 CH Hanson 03040 Magnetic Stud Finder normally uses very powerful rare earth magnets to be able to locate the exact location of nails or screws in a stud. Therefore, you don’t need to worry about replacing batteries. 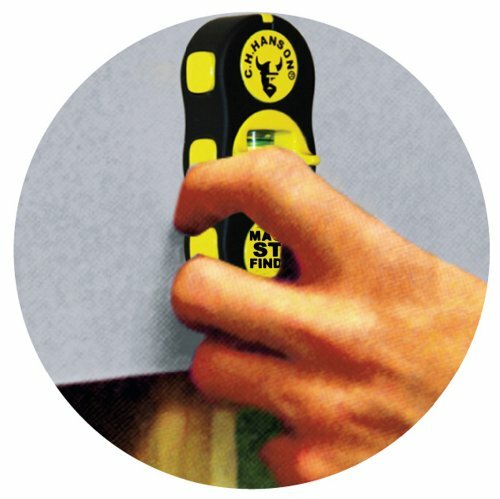 To use this stud finder, just place it on the wall and then sweep in an “S” pattern and you will be able to locate any metal fastener around. So never again will you wonder if there is a stud behind the well, using this stud finder you’ll know for sure. 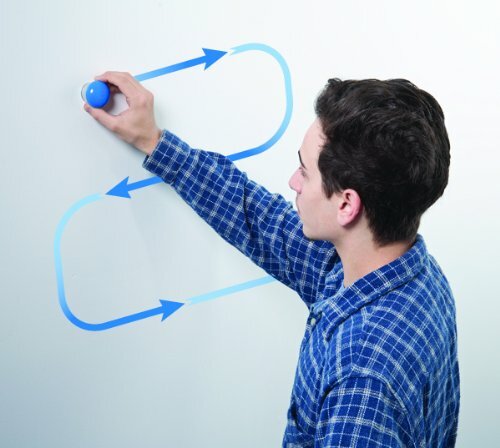 Boasts two-way level that conveniently helps you accurately mark up the wall for your specific project. Measuring 4.6 inches by 1.5 inches by 7.5 inches while weighing 3.2 pounds only, this is one of the best compact and lightweight stud finders. Great ergonomic shape along with soft grip hence fits comfortably in your hand. Clings to the wall via a strong magnetic force once it detects metals. 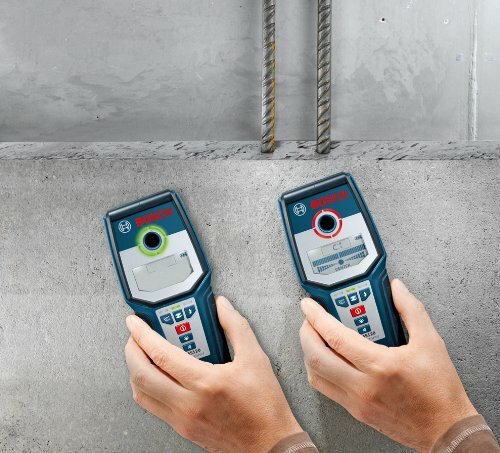 While there are many affordable stud finders on the market, finding a reliable tool that is right for the job can be a challenge. That is why we bring you this Zircon e50-FFP Stud Sensor e50. 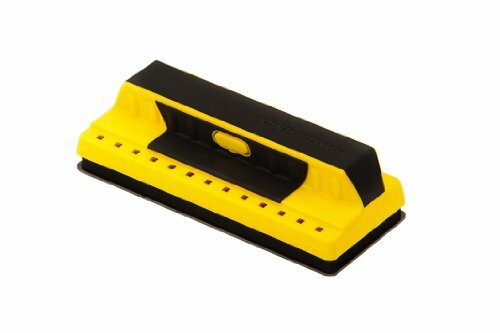 This stud finder offers many great features and boasts a great body design thereby allowing you to hold it comfortably by hand at any angle. Being electronic, it is highly accurate hence chances of normal scanning errors are very minimal. 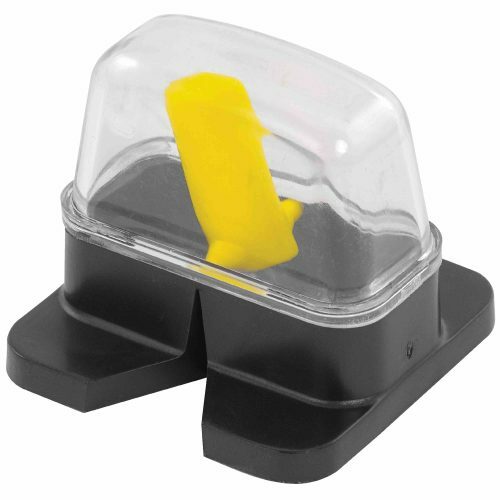 It also features rubber over-molded grip to give you a more secure hold while using it. Small LCD screen that is easy to read and requires a fully charged 9V battery to run smoothly. It shows you the position of the edges of studs. Can locate the edges of metal or wood studs of up to 19 mm deep when in stud scan mode and up to 1.5″ deep when in deep scan mode. Boasts patented spotlight pointer technology that normally shines an arrow-shaped light on the wall in order to mark the target. Equipped with a wire-warning detection that shows the presence of any live-wire up to 2-inches deep. Patented-trucal technology to show exactly when the tool has been calibrated and when ready for scanning. 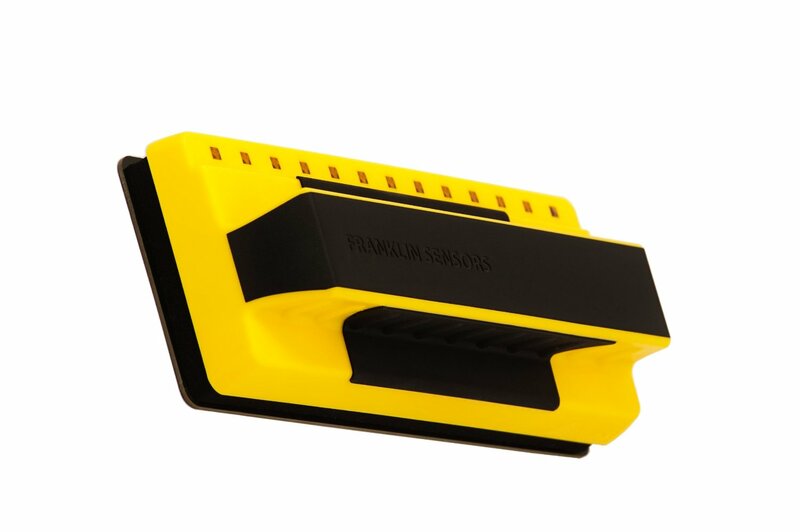 If you want dependable stud finders, something that should last you for a very long period of time and which won’t frustrate you at all, then this Franklin Sensors ProSensor 710 is your tool. It offers remarkable stud finding quality and can work equally great for both professionals or ambitious DIYers. It merges two types of stud finding into one tool for your convenience. It works by identifying the width of the hidden objects so that you not only know their position but also their size. Uses an array of bright LEDs lights to show you the presence of an object behind the wall. This allows you to quickly visualize the location of the studs. Offers deep scanning giving you the ability to punch through thicker walls up to 1.5 inches to be able to locate studs. 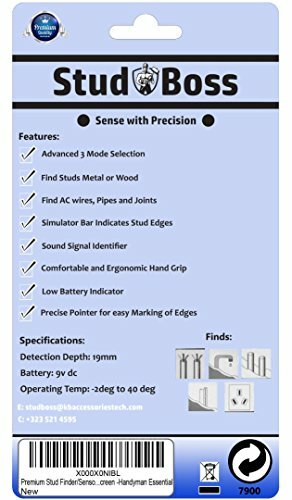 Uses advanced multi-sense technology that is able to identify the position of multiple studs simultaneously by sensing the wall in thirteen different locations. These stud finders are powered by two AA batteries. 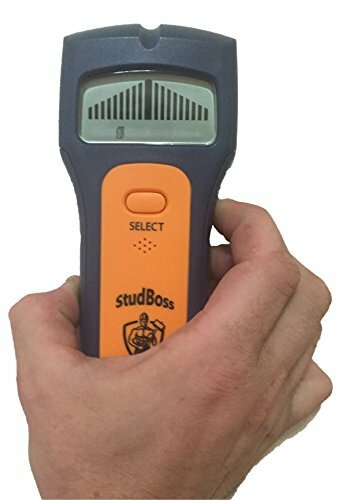 This is one of the most affordable and unique stud finders on the market today. 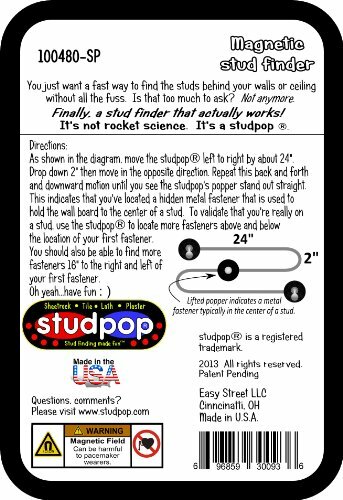 Measuring 6 inches by 4 inches by 1.7 inches while weighing 0.8 ounces, Studpop Magnetic Stud Finder is pocket-size and lightweight and hence easy to use. 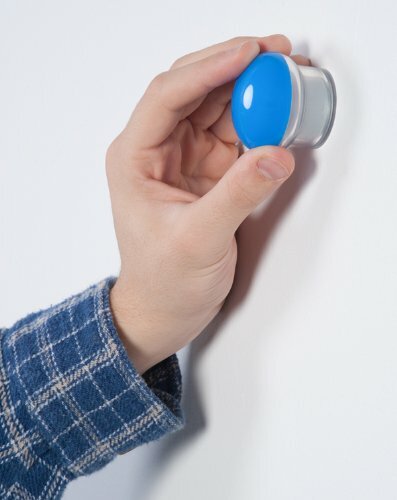 Its round design, on the other hand, makes this tool easy to hold and slide around a wall. 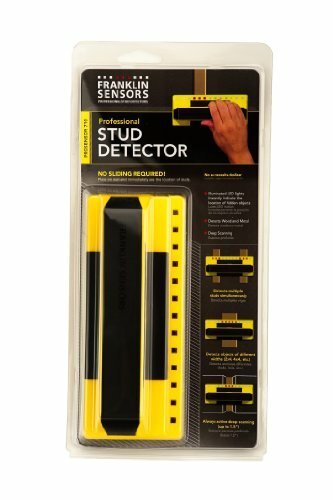 To find your studs, run this stud finder along the wall and once it senses any stud, it will just pop out. 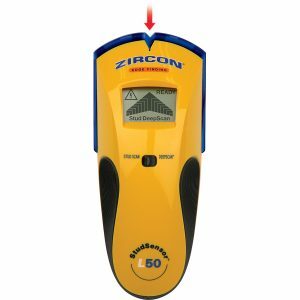 You can use it on tile, sheetrock, lath and plaster and produces accurate results every time. It is made in the USA and is available in a variety of colors to choose from. 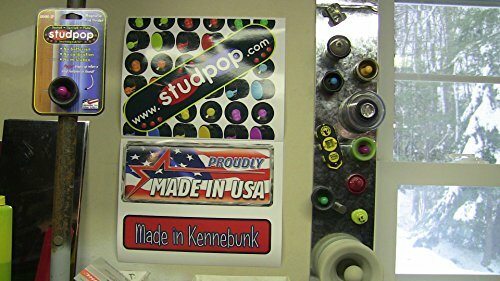 Boasts unique popper that shows once it locates the metal fasteners in studs. 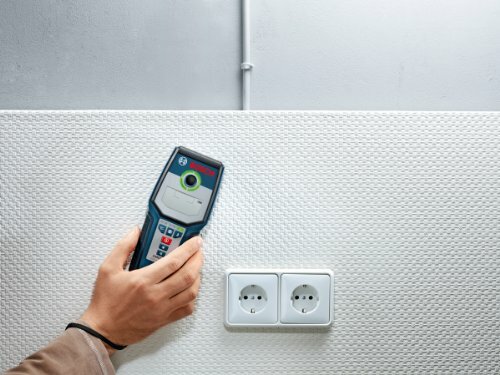 This is yet another solid stud finder that stands up to tough project conditions without failing and is ideal for ambitious homeowners or even for greater professional installation. Made in China, this stud finder comes with two AA alkaline batteries for long lasting performance. 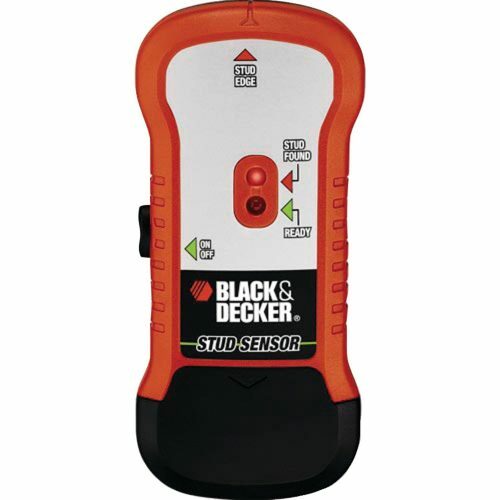 Black & Decker SF100 Wood Stud Finder boasts a compact design hence it is easy to use and hold. On the other hand, it works by moving over the surface of the wall. 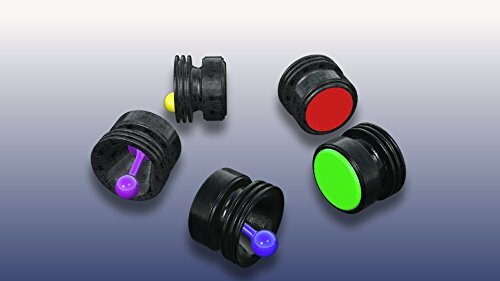 Includes a stud sensor with LED indicators that allows you locate the studs accurately. Capable of detecting wood studs of up to 3/4 inch thick and is made of plastic material. Its sensor normally lights and even beeps once a stud is detected. 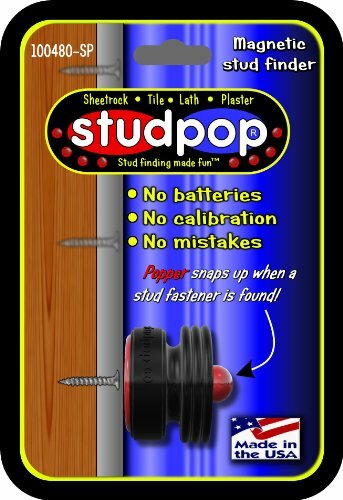 Being one of the best stud finders in this review, it boasts a design that usually delivers high-availability as well as scalability and for maximum performance and flexibility. 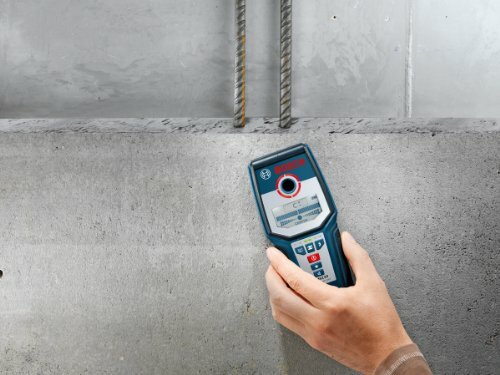 Frequently mentioned among stud finders that offer consistent material coverage and deep detection, GMS120 comes across as a well built and technologically advanced tool. It features multi-mode detection for metal objects, live wiring, and wood studs with its illuminated graphical LCD display indicating the detection strength. The level of detection is simply astounding even when you use it on steel surfaces where it penetrates up to 4-3/4 inches deep. To enable this Bosch machine to meet this high level of performance is am an intuitive German-made operating system that allows one to explore across 3 selection modes namely: metal, AC wiring and wood mode. Thanks to its 3 consistent modes alongside a digital multi-scanner, this tool fares pretty well on wooden as well as metallic surfaces. High degree of precise automatic calibration making it easier to use while pinpointing the center of the spot that has been detected. 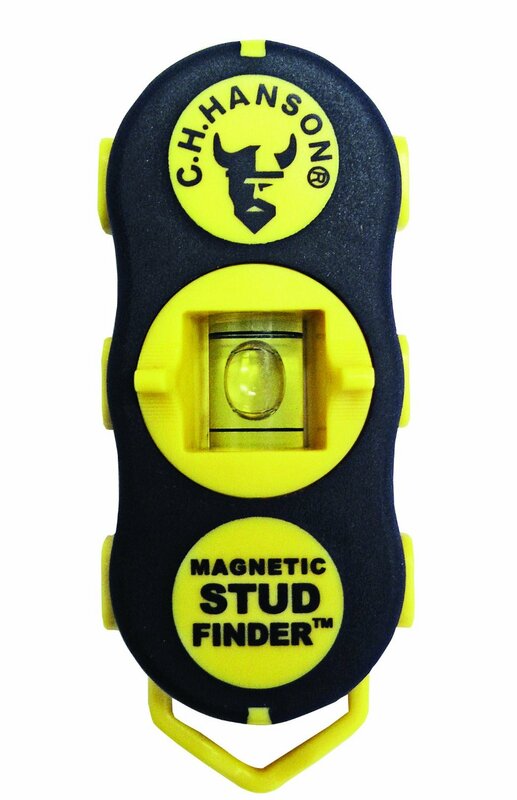 This is one of the stud finders that provide an illuminated ring which indicates the detection status complete with an audible signal for improved user experience. Comes with a carrying pouch and 9-volt battery. This single dielectric tool is one of the stud finders that have made their impact known on the market for many years. On the surface, it may look like a simple DIY toy – but a closer look reveals just how advanced it is technologically. First, its outer casing is strong and diligent to protect the delicate inner parts in case of an accident. 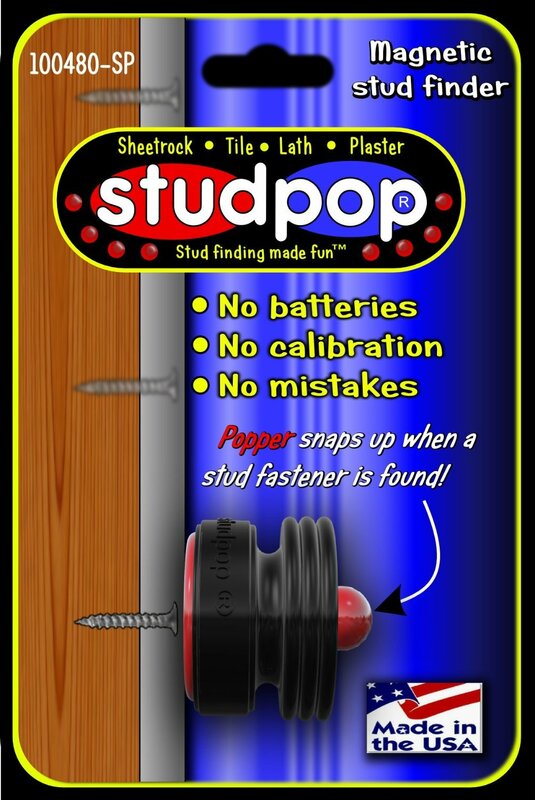 Inside the stud is the latest finding technology available on the market. 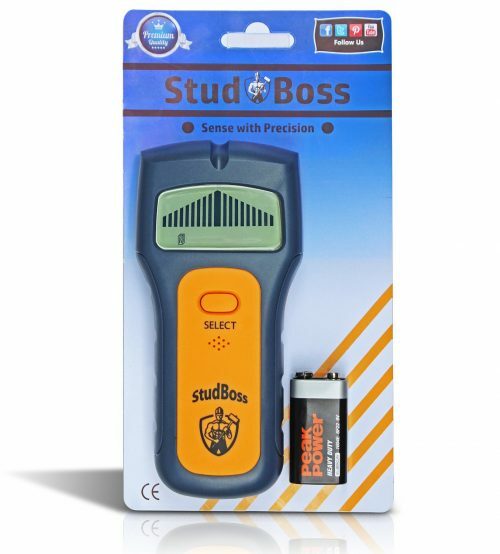 Powered by a 9-volt battery, StudBoss Digital LCD Stud Finder is ready to use as soon as you receive it. Offers advanced 3 mode capability which transcends metal, wood, and even concrete surfaces. 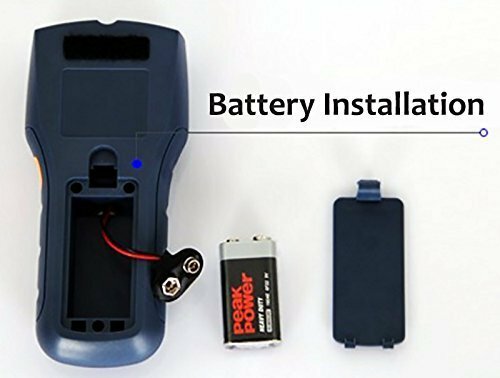 Has a clear LCD window which alerts you in case the battery is running low or in case there are variations in the signal. For easy handling, its durable outer layer is further enhanced by the presence of an ergonomic grip. This minimizes chances of falling accidentally. Protected by a 1-year warranty and can be fully returned within the first 30 days of using it if it doesn’t meet expectations. The screen doesn’t light up. This is one of the stud finders that are tricky to use in dark areas. 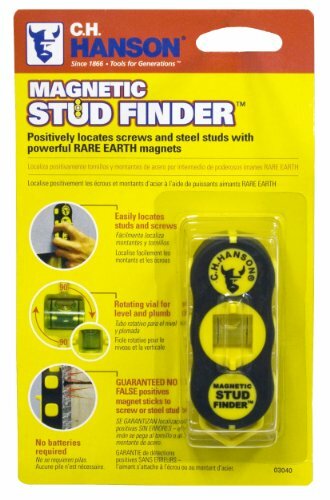 Of all the stud finders reviewed in this write-up, this is one of the few of its kinds. 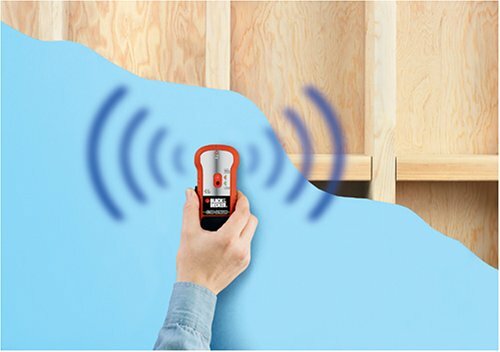 To begin with, Stanley 47-400 Magnetic Stud Finder is a magnetic stud measuring just about 35x35x32mm. Its methodology of working is pretty simple and straight to the point. 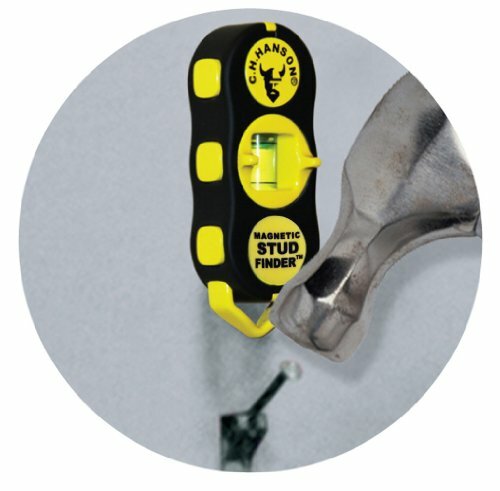 The magnet locates steel nails and screws providing dependable detection of wall studs. Its base is notched for convenient marking once studs are pin-pointed. Its dome and harness are fixed under a black plastic browsing sled with a smooth bottom allowing you to scoot easily across wallboards. 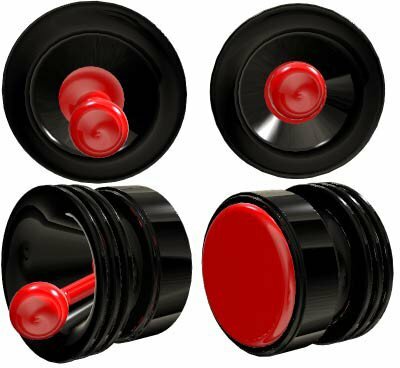 The magnet has a specific affection for the nail-heads hidden beneath hard-to-reach surfaces with the toggle quivering with interest whenever you steer it over some nails. Offers a cheaper alternative that doesn’t disappoint as far as providing dependable detection of wall studs is concerned. Its method of operation is relatively straightforward making it pretty easy to use. Weighing just about 1.6 ounces and spanning 35x35x32mm, this tool is easy to hold on the palm meaning that its secure and chances of accidental falls are minimal. Covered by limited lifetime warranty. 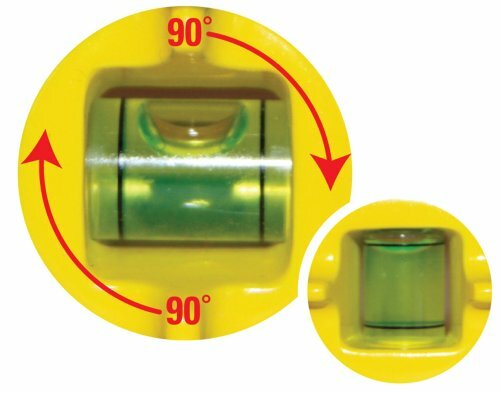 Lauded as one of the most professional stud finders in the industry, 10129-ST provides two magnets which are pretty effective at locating studs in ceilings and walls. It is a relatively inexpensive way to eliminate guesswork in identifying positions behind different surface thicknesses or internal materials in your home. It’s correct to call it a professional-use stud, but a closer look at it reveals that it can actually be used by any DIY enthusiast – thanks to its simplicity. And what about accuracy? It’s highly accurate compared to other stud finders. Optimized for professional work making it one of the most effective tools available out there. Highly sensitive and super strong offering superior detection. Works effectively on all types of surfaces be they walls or even ceilings. 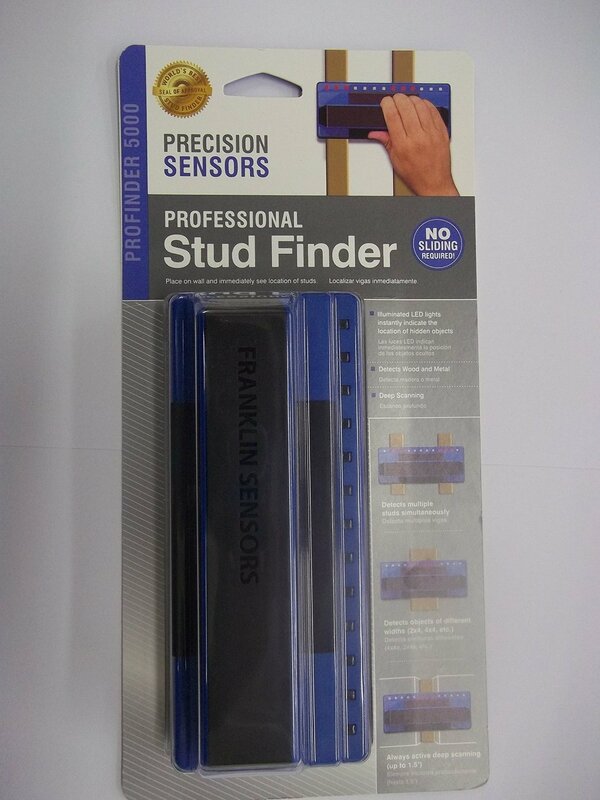 Profinder 5000 looks a tad different from other stud finders. 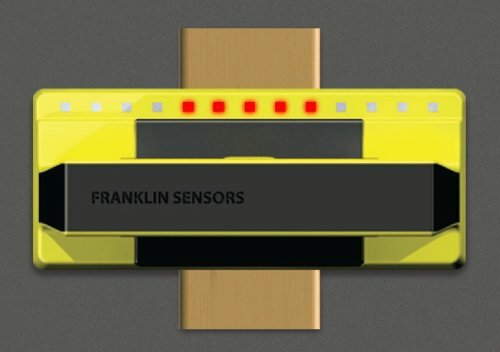 First, instead of detecting studs in a single sensor window, it scans the wall along its entire 7-inch width thus increasing its scope and making locating of studs much easier and faster. Once the hidden studs are detected, a series of LEDs light up. 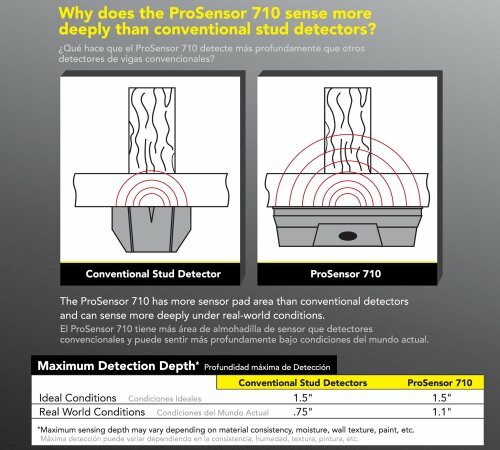 Another difference from other stud finders is that Profinder 5000 can detect multiple studs at the same time. Seamless detection of metal, wood, and other hidden items. It’s very easy to operate as you only need to hold one button down to switch on. Boasts an intuitive LED display which showcases the location of hidden objects. 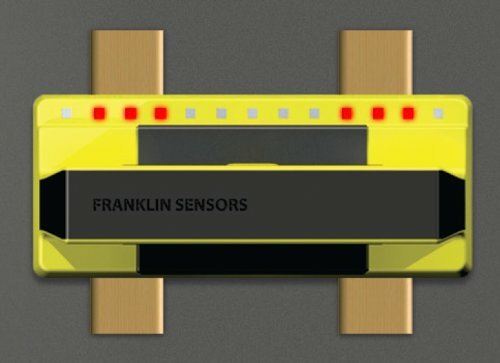 Has a wider sensor pad area making detection more accurate even in places with difficult features. Can easily be initialized on any position along any surface. Do I Need a Stud Finder? 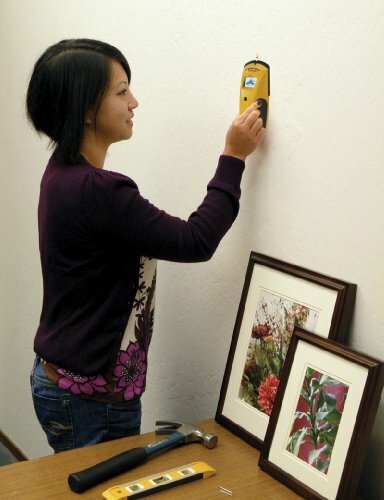 If you handle any home or office improvement tasks, you need to have a stud finder. Whether you are planning to embark on some heavy hanging artwork or you are just looking to install a new chandelier from the ceiling – stud finders can be your best bets. Otherwise, you could end up banging the entire wall and leaving marks all over the surface as you try to locate studs. 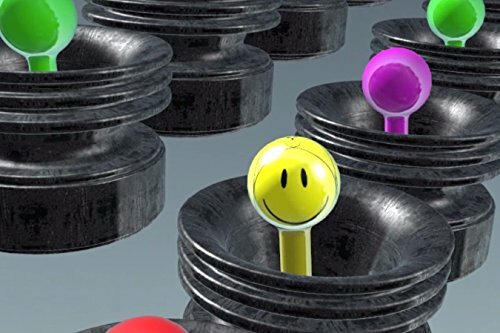 Using these cute tools makes the whole job much easier and helps you save a lot of time. Competition for the top spot was pretty stiff especially with the likes of Profinder 5000 and Bosch GMS120 in play. 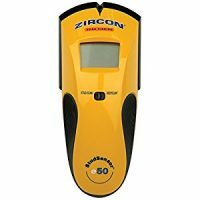 The overall top position, however, goes to Zircon e50-FFP which is renowned for its accuracy, great grip and above all the patented spotlight pointer technology.